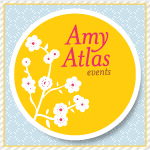 I am so excited to share with you all my new logo for RubyJu! I can't thank Sarah of Style Me Gorgeous enough. She has truly captured all my ideas & visions that I had and created the perfect logo for my business. Thank you so much Sarah!